Background: The study aimed to verify the accuracy of volumetric rendering software on cone beam computed tomography (CBCT) and multislice computed tomography (MSCT)-derived surface models. Materials and Methods: Gutta Purcha cone tips were fixed on 14 points at the facial surface of five dry mandibles. The mandibles were scanned twice with each scanner on three occasions. 26 distances were measured 10 times, using digital calipers. The surface models rendered by the software were linearly measured thrice and their means recorded. The data sets were subjected to vigorous statistical treatment using analysis of variance and Tukey test. Results: The caliper measurements, the CBCT and MSCT images were comparable, indicated by an F = 0.0003 and a Tukey T value (8.7), larger than the absolute difference between any two means. Thus, confirming the linear accuracy of the software. Conclusions: "SolidPlanner" volumetric rendering program yields a near 1-to-1 ratio with reality. The program enjoys linear accuracy, which remained submillimeter accurate, emphasizing the validity of the program as a measuring tool. Aims: This study compared fractal dimension (FD) values on mandibular trabecular bone in digital and digitized images at different spatial and contrast resolutions. 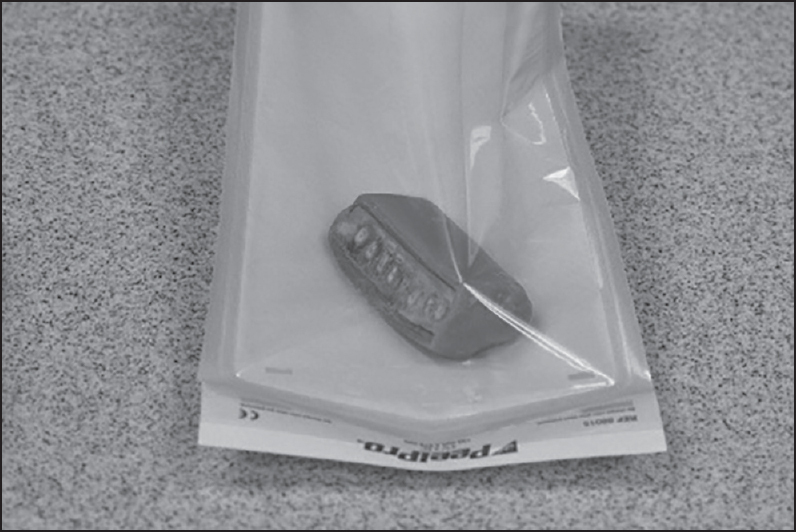 Materials and Methods: 12 radiographs of dried human mandibles were obtained using custom-fabricated hybrid image receptors composed of a periapical radiographic film and a photostimulable phosphor plate (PSP). The film/PSP sets were disassembled, and the PSPs produced images with 600 dots per inch (dpi) and 16 bits. These images were exported as tagged image file format (TIFF), 16 and 8 bits, and 600, 300 and 150 dpi. The films were processed and digitized 3 times on a flatbed scanner, producing TIFF images with 600, 300 and 150 dpi, and 8 bits. On each image, a circular region of interest was selected on the trabecular alveolar bone, away from root apices and FD was calculated by tile counting method. Two-way ANOVA and Tukey's test were conducted to compare the mean values of FD, according to image type and spatial resolution (α = 5%). Results: Spatial resolution was directly and inversely proportional to FD mean values and standard deviation, respectively. Spatial resolution of 150 dpi yielded significant lower mean values of FD than the resolutions of 600 and 300 dpi (P < 0.05). A nonsignificant variability was observed for the image types (P > 0.05). The interaction between type of image and level of spatial resolution was not significant (P > 0.05). Conclusion: Under the tested, conditions, FD values of the mandibular trabecular bone assessed either by digital or digitized images did not change. Furthermore, these values were influenced by lower spatial resolution but not by contrast resolution. Objectives: Artifacts due to the Gutta-percha may result in an incorrect diagnosis when using cone-beam computed tomography (CBCT) only. Compare CBCT scans with photostimulable phosphor (PSP) plates using one angulation and PSP plates using two different angulations in detecting root fractures (RFs) in endodontically treated teeth. Materials and Methods: Sixty-six roots were collected and treated endodontically using gutta-percha. One-half of the roots were randomly selected and fractured. 8 cm × 8 cm fields of view (FOV) were acquired with a CBCT machine. Periapical radiographs (using intra-oral PSP plates) were also acquired using one and two angulations. Results: The area under the receiver operating characteristic curve and sensitivity were significantly greater using CBCT than using one or two PSP plate angulations. There were no significant differences between one or two PSP plate angulations. Conclusion: The accuracy of RF depiction in endodontically treated teeth using 8 cm × 8 cm FOV CBCT was greater than that obtained using one or two PSP plate angulations. Objectives: Odontomas are the most common variety of odontogenic tumors and derived from differentiated epithelial and mesenchymal cells. The purpose of this study is to evaluate the prevalence, types and localization of the odontomas in Turkish patients. 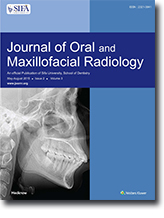 Materials and Methods: This was a retrospective study of panoramic images that were taken between April 2011 and January 2014 in the Department of Dentomaxillofacial Radiology, Gulhane Military Medical Academy (GATA), Turkey. 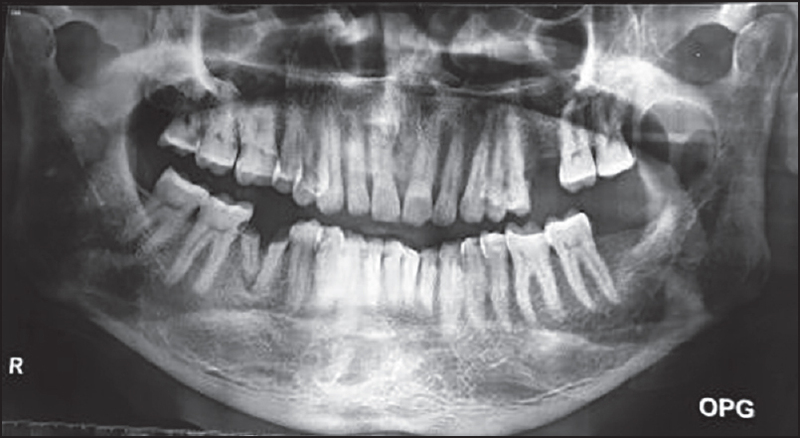 A total of 14,250 panoramic images were evaluated by an experienced dentomaxillofacial radiology specialist. The clinicopathologic features of odontomas such as, anatomic location, distribution in gender, age of the patients and the incidence of the odontomas were assessed. Results: A total of 22 odontomas in 20 patients (11 females; 9 males) (0.14%) were found of the 14,250 patients` panoramic view. About 36.4% of the lesions were complex odontomas and 63.6% were diagnosed as compound odontomas. About 18.2% of all cases were in the maxilla and 81.8% in the mandible. The anterior portion of mandible was found the most common location (40.9%) in this study. Conclusions: According to the result of this study, the compound types of the odontomas are more common than complex odontomas and the anterior mandible is the most affected site. It was noted that even though odontomas are the most common variety of odontogenic tumors, they rarely occur. Context of the Study: In India, cone-beam computed tomography (CBCT) has lately gained popularity as preferred imaging modality by the dental practitioners in recent times. However, CBCT is included neither in the undergraduate nor the Postgraduate dental curriculum. There is also a lack of any standardized training modules on CBCT. Many CBCT imaging centers are being established in various cities of India lately; however optimal use of this technique cannot be assured without assessing the attitude and present status of knowledge of the dental practitioners in this field. This shall warranty some remedial steps; in case a gap in knowledge is identified. Hence, this study was designed to analyze the current status of the knowledge, attitude and perspective of the dental practitioners in Pune, Maharashtra toward the use of CBCT. Materials and Methods: A survey was conducted among dental specialists, using a structured questionnaire. This was complemented with the opinion of the experts in the field of Oral Radiology. Results: The study results indicate that there is a definite gap in knowledge of CBCT applications among the dental specialists. The dental specialists themselves feel that there is a lack of awareness as well as training in this field, and strongly perceive a need for the same. Even the experts in the field of oral radiology strongly agree educational strategies must be developed for training in CBCT. Introduction of training in CBCT at undergraduate as well as Postgraduate level, and developing well-structured training modules shall ensure that dental specialists use this technique in an efficient way to improve the accuracy and reliability of Oral and Maxillo-facial diagnosis, treatment planning and outcomes. Gardner's syndrome (GS) is an autosomal dominant, well-documented disease with characteristic systemic and maxillofacial manifestations. The diagnosis of GS is established by the presence of simultaneous findings of intestinal or colorectal polyposis and jaw pathologies. Multiple polyps of GS are likely to become carcinomas at older ages. Cooperation between medical disciplines is important in the diagnosis of GS. Patient with multiple adenoid polyposis should be referred to dental examination in order to discard GS. Dental radiographic examination may be crucial in the primary diagnosis of the disease. 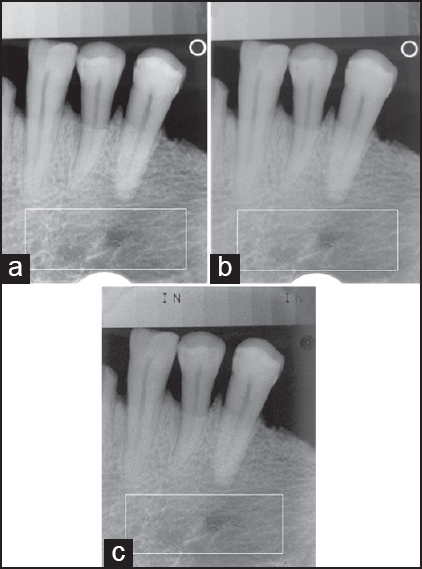 In this case report, a case of GS is presented with prominent histologic features and the importance of the dental examination in the diagnosis of GS is discussed. Mandibular fractures are relatively easy to diagnose in comparison with other craniofacial fractures. This report presents a trauma patient with an unusual split fracture in the mandibular corpus, which was missed on the panoramic radiograph; however, could be visualized with cone-beam computed tomography (CBCT). 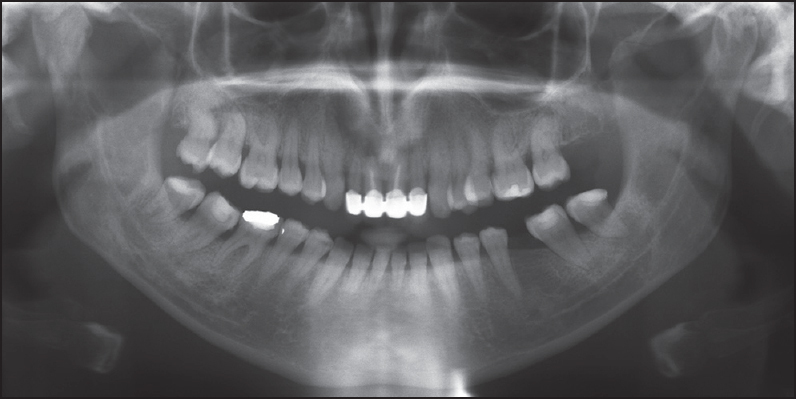 Panoramic radiograph may be misleading for accurate diagnosis of mandibular corpus fractures. 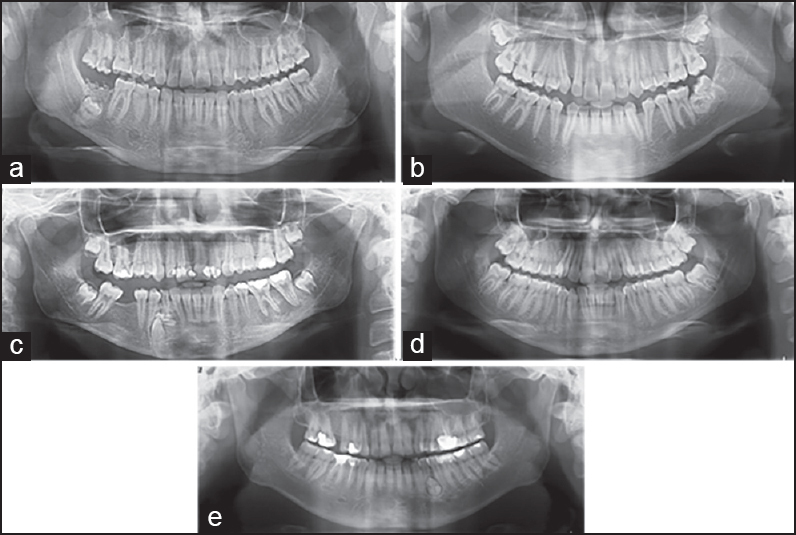 We suggest that CBCT is crucial and should be mandatory for all suspected mandibular fractures in maxillofacial trauma patients. Dentigerous cysts are the most common type of benign odontogenic lesions that associated with the crown of an unerupted or impacted tooth. They constitute the second most common cystic lesion of the jaws, after radicular cysts. Dentigerous cyst surrounding impacted teeth often displace these teeth into ectopic positions. Ectopic eruption of teeth into regions other than the oral cavity is common but dentigerous cysts associated with ectopic teeth within the maxillary sinus are fairly rare. The diagnosis is usually made by panoramic radiography. Cone beam computed tomography (CBCT) is indicated when an ectopic tooth is associated with an antral mass and prior to surgery. The standard treatment for a dentigerous cyst is enucleation and extraction of the cyst-associated impacted or unerupted tooth. 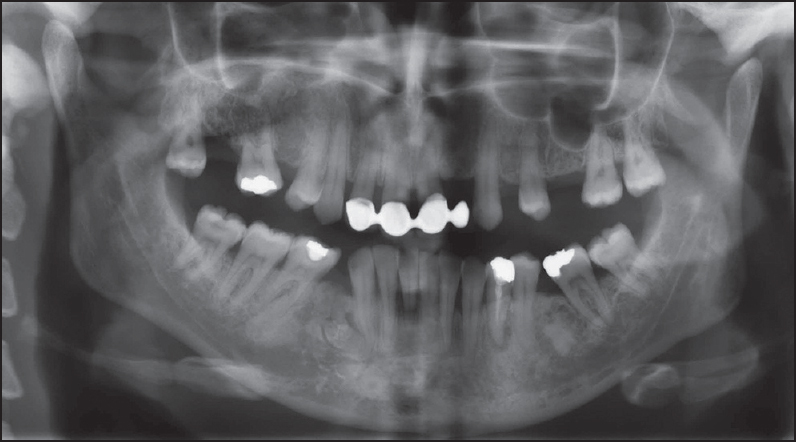 We report CBCT findings of two cases of dentigerous cyst associated with an ectopic tooth in the maxillary sinus and review the literature reports of this condition over the past 34 years. Odontogenic keratocysts (OKCs) are benign, they are often locally destructive and tend to recur after conservative surgical treatment. There has been a shift in the treatment modality from conservative procedures like marsupialization and enucleation to the more conventional surgical methods. 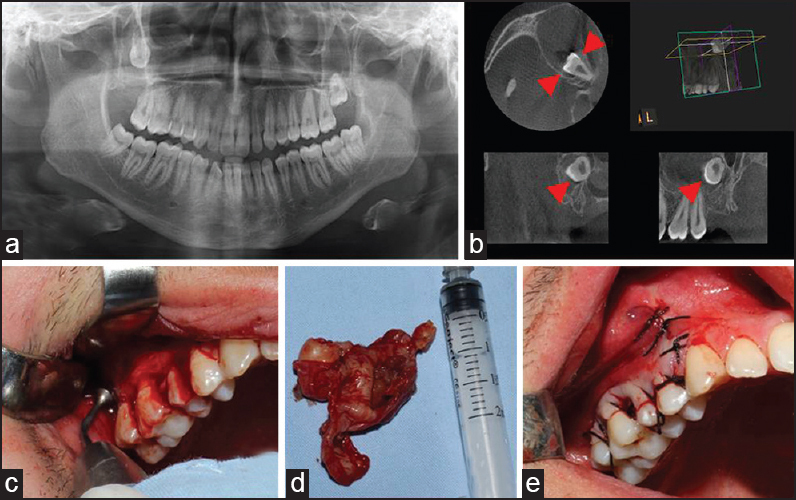 However, the recurrence rate after marsupialization, followed by enucleation is not significantly higher than that after aggressive modalities. The goals of treatment should eliminate the potential for recurrence and minimize the surgical morbidity. Future treatment may involve molecular-based modalities, which may reduce or eliminate the need for aggressive surgical management. A case report is presented in which isolated OKC at the level of sigmoid notch is treated by surgical enucleation and chemical cauterization (with Carnoy's solution).